Luxembourg or also known as Luxembourg City is a small country surrounded next to Belgium, France and Germany. Despite of its size and the popularity of its neighborhood countries, Luxembourg has a rich history and it is one of many countries to have the highest GDP in the world. It is a great place for a weekend getaway or as a road trip across Western Europe countries. 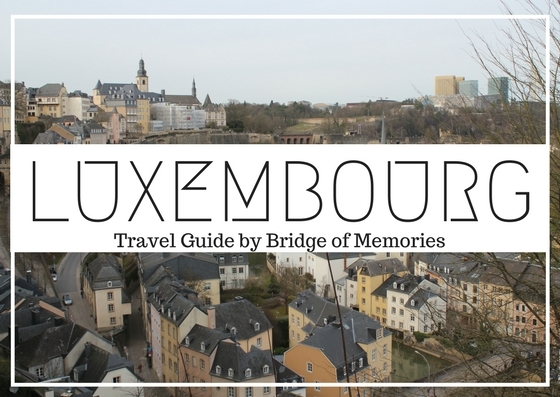 What to see in Luxembourg City? Located in the Luxembourg historical center, Bock Casemates have been added to the list of UNESCO world's heritage sites. A nice walk around rocky cliffs and casemates will offer a nice view over Luxembourg and over the river Alzette. A residence of the Grand Duke of Luxembourg guarded by guards in front of the palace. A Roman Catholic church located south of Luxembourg City. A beautiful Batoque style church which you can see from far. Fort Thungen is a historic fortification located in the Kirchberg district. Most of the original building was destroyed after 1867, only the foundation and the three tower is what has been left. Behind Fort Thungen, Mudam a modern art museum have been placed. Loved this space of the museum! Luxembour City has some nice bridges that remained me as in Harry Potter. That includes Adolphe bridge and Passerelle. It is a town square located in the heart of historic Ville Haute quarter. You may find here a City Hall and also a statue of Grand Duke William II. Place Guillaume II is used for various events, such as Saturday's farmer market or open air music venues. Chemin de la corniche is a pedestrian promenade, a balcony to the view of Luxembourg City across the river. It is such a nice walk around here, and you will literally get the view of Casemates and downtown from different angles. This was my highlight of the trip. I totally fell in love with the building from all angles. This Philharmonie of Luxembourg, a concer hall is located in Kirchberg district. Loved that people can walk around the white steel facade around the building, it felt like in a maze. This building was designed by an architect Christian de Portzamparc and it was opened to the public in 2005. First time stepping into this square it felt like in a French movie. Surrounded by Saturday antique market, outdoor coffee shops and the vibe of happy people was just pleasing. Place d'Armes square is considered to be the main square and center of Luxembourg old town. Grund is a district in the south of Luxembourg and its located below the valley on the banks of the river from Luxembourg old city. You can access down to Barrio Grund by foot down the hill or by a lift. Apparently, Grund area is popular for its nightlife, but as well as for the picture perfect view up to historic Luxembourg Bocks. How to get around in Luxembourg City? However, Luxembourg City is very convenient to walk around. Especially in the city center you won't be able to get around with buses. Thus, walk or cycling is the best option in the city. Where to eat and drink in Luxembourg City? We took Ryanair (yes, again) from London Stansted to Luxembourg. Airpot is super close to the city and there are regular buses running from the airport. Depending on where is your accommodation located, check your bus line and schedule on their official site. We took bus number 16 which goes all the way down to Central Station passing the city center. We get off just near the city center and took us about 20-25 minutes to get to the hotel. The bus ticket purchased on place cost us €2 per person. During our weekend stay in Luxembourg City we have stayed in a nicely located Best Western Plus Victor Hugo Grand Hotel which was just 10 minutes walk to the city center. Good guide, very comprehensive! You seem to have enjoyed Luxembourg. Just a small addition: when you get a daily ticket, you can not only take any bus in the city, but also any bus or train anywhere in the whole country! And that's where it gets interesting, because there are so many places you can visit, since it's such a small country.